"Orphan Tessa Gray, sixteen, crosses the ocean from New York to find her brother Nate in Victorian London, her only possession a clockwork angel necklace from her mother. She is ignorant of her power to transform; the Dark sisters are not. They kidnap her for the Magister, who wants to marry Tessa and claim her power. Shadowhunters, warriors of angel blood, battle demons and keep the peace in the Downworld of vampires, warlocks and other supernaturals. Orphan teen Shadowhunters Jem, Will, and Jess rescue Tessa and agree to help save Nate. Vengeful vampire Lady Camille Belcourt and her current lover, warlock Magnus Bane provide entrée to the Magister's secret Pandemonium Club." When I started reading Clockwork Angel I didn’t know what to expect. I guess after reading The Mortal Instruments series I was expecting something similar, but this book was nothing like that. I ended up liking this book more than I ever imagined I would. I loved all of the characters and the time period the book was in. I thought it was an interesting twist on the Shadowhunter world I have grown to know and love. Tessa was an amazing character. Even though she was struggling to figure out who and what she was, she remained strong. While she was locked away with the Dark Sisters, even though there were times she thought there was nothing she could do, she never gave up her fight. She was determined to save her brother and escape. Tessa is also such a loving character, and that makes me love her even more. Despite the fact that it is her brother’s fault that she is captured, she never blames him and always thinks the best of him. She knows he is the reason she was brought here, but still is fighting to not only save herself, but to save Nate. I loved this about Tessa. I also adored Will and Jem. I found myself torn between the two throughout the book. Will is tormented, but you can tell he cares for Tessa, no matter how much he tries to hide it by being mean to her many times throughout the book. I can’t wait to keep reading and to find out more about Will’s past. I can’t wait to learn more about him and to hopefully see him open up to Tessa. I loved Will so much, but sometimes he was so mean that I found myself leaning towards Jem who was always incredibly nice. Jem is an amazing character. He is so calm, patient and caring. He is probably the only person I’ve seen so far who is able to handle Will all of the time. Jem is also incredible because of how strong he is, even when he is at his weakest. He has an excuse to sit back and focus on his own health, but he never takes that excuse. He always wants to be seen as an equal to the other fighters no matter how sick and weak he may be. Will and Jem are both such great characters for such completely different reasons. As I got closer and closer to the end I couldn’t help but to like Tessa even more. She was constantly confused about her feelings for Will and his feelings towards her, but she never lets that get in the way of what is really important to her. Even when her trust is betrayed towards the end of the book, she doesn’t let that stop her from fighting for her life and for the people she may not have known long, but has begun to care for. Tessa is a great character for everything she does and the more I learned about her as the book went on, the more I liked her. I know that as the series continues I will only grow to love and appreciate her more. I am so glad I decided to read this because I have grown to love Tessa, Will and Jem. I can’t wait to read the next book of the series and see what is in store for these amazing characters. 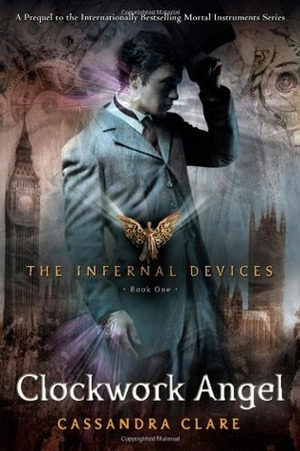 in a way The Infernal Devices are so much better than the the Mortal Instruments but i totally wouldn't trade them with anything for the world... Cassandra Clare is a marvelous writer and her books keep getting better and better. This is a pretty fabulous series. I'm really glad you gave it a chance and enjoyed it, Nicole. Great review! I have to say, I liked TMI, but I LOVE TID so much more. CA didn't impress me as much as CP did though. This love triangle definitely breaks your heart. Great review Nicole! I have this book and for some reason just have not been able to pick it up. Looks like I need to move it up the TBR and get going. Thank you for sharing with us. Hope you get to it soon. It's a great read.